PSA: If you are looking for correct grammar or spelling, you may be in the wrong place. If however, you are looking for a LOVE STORY.. Read ON! 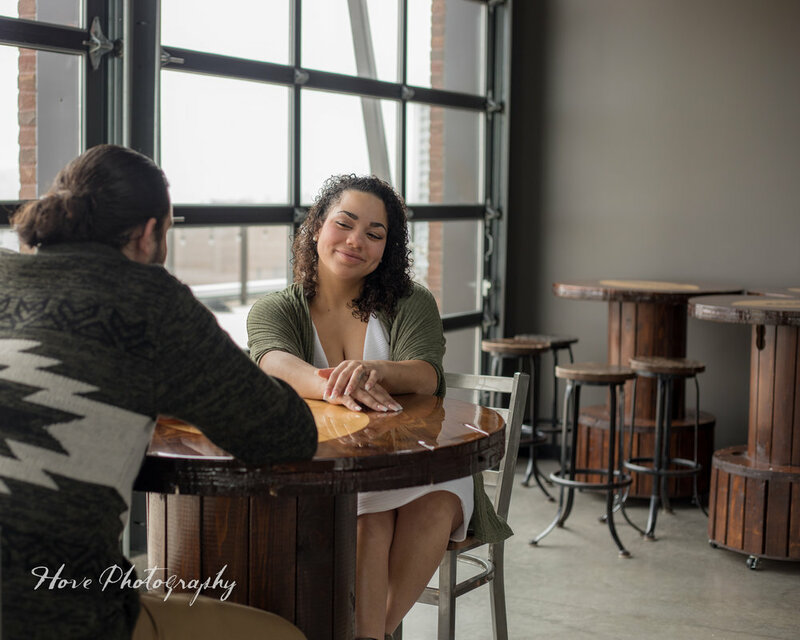 Old school class and rustic industrial vibes mended together on Sunday January 22nd for Jasmine and Paul’s engagement session at Heritage Hill and Titletown Rooftop Bar. You would think these two locations have nothing in common, but there my friends you would be wrong! Heritage Hill a well known historical site with enormous buildings and aged barns was the perfect finish to the Rustic, new school industrial space of Titletown’s rooftop bar. The best of both worlds you could say. The locations were the perfect way to show the edgey and classy side of Jasmine and Paul. Wildly different but yet complimentary, exactly like the couple I met. 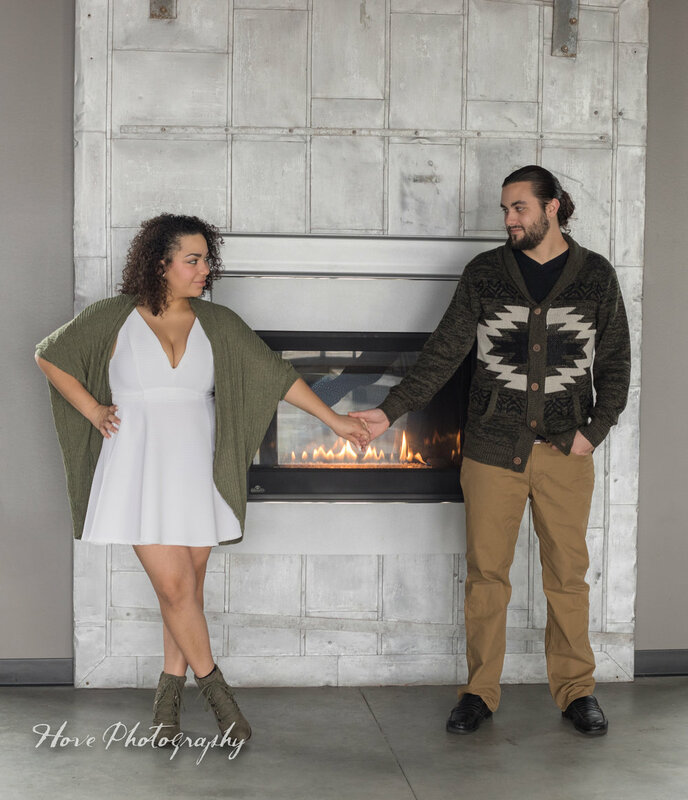 Jasmine and Paul seemed to share the same diversity as their photoshoot locations. Paul, quiet, reserved almost humble in nature was a stark contrast to Jasmine’s bold, diverse, and electric nature. You hear people say it often.. opposites attract. Nothing could have been more true for this couple. I had a fantastic time learning about Jasmines personality, she made me feel at ease and well to be frank, reminded me of myself at times: outgoing, social butterfly, and energetic. With that being said, Paul also had a lot in common with me. He too enjoys photography! I can’t wait to see all that you do with your photos!!! It took no time at all before we were chatting like old friends, discussing their wedding and her vision for the day! A beautiful vision at that, she explained how she wanted a “ casual day, filled with warm deep reds and burlap, complimented by pearls”, which she added, “were Paul’s idea!”. You see, even their wedding will be filled with bold colors complimented by soft delicate pearls. Paul and Jasmine have been together a little over 3 years and met 2 weeks after he returned from the Navy. Their photos speak to their loving/gentle nature but also bold ambitious personalities (once you get to know them of course!). So many times we hear people say, “Just wait, the ONE is out there for you”. So many times people don’t believe it. If there is one thing I have learned in this job, it’s there truly is SOMEONE for everyone. Love is everywhere and sometimes its just takes four years in the Navy, two tours, and 2 weeks to find it!! Congratulations you two!!! So happy for you both and can’t wait for our Family Photo Session!!! Lastly, I would like to extend a huge thank you to Early from Heritage Hill. His customer service was outstanding and he made my new friends feel like a King and Queen as we rolled around on our golf cart!! Thank you for all your help. Secondly, Thank you to Titletown Brewing company for allowing me to use the Rooftop Tap! THANK YOU! 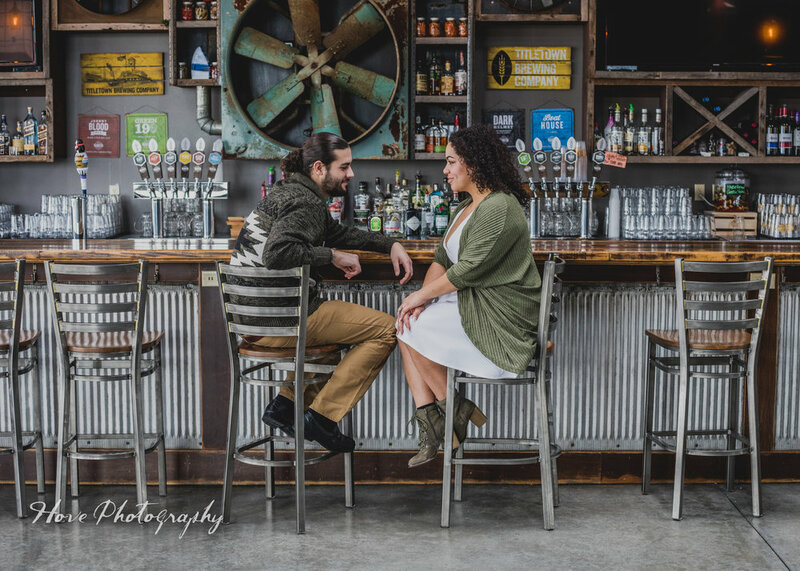 #HeritageHillEngagement #TitletownBrewing #HovePhotography #Engagement #RusticVibes !